Make all of the guests ready to jump into a famous video game world when you have Super Mario Bros Party Supplies for your next big birthday bash! You can use tableware like plates and napkins to make the meal and some tasty cake easy to clean up after, party favors to help your guests remember the fun, and decorations to turn your party space into a classic video game design! Super Mario is one of the most famous video game franchises of all time. Players guide brothers Mario and Luigi through different levels and worlds as they try to rescue the kidnapped Princess Peach from evil Koopa King Bowser. Through its wide selection of games, including the original Super Mario Bros. and newer spin-off games like Mario Kart, Super Mario and its slew of famous characters have a special place in the hearts of children and adults alike. From balloons and party favors to piñatas and costumes, Birthday Express has all the supplies you’ll need for a spectacular Super Mario birthday party. Start thinking about party food early. Look for creative ideas online so you can incorporate your theme into the main course, dessert and snacks. You’ll be amazed at how many themed party ideas and recipes you can find on Pinterest and party planning blogs! Putting together the perfect birthday party can be hard, but you don’t have to do it alone. Find expert tips and tricks on the Birthday Express Ideas Blog for throwing a successful and memorable birthday party that your child will never forget. 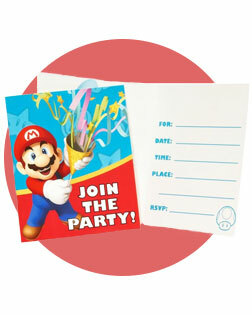 Let your child’s friends know you’re throwing the ultimate Super Mario birthday party with these themed invitations. Each card features a colorful Mario inviting guests to save the date and prepare for a special party they’ll remember for years to come. You’ve decided on a theme, and the simplest way to let that theme shine throughout your party is with decorations. With a wide selection of Super Mario party supplies available from Birthday Express, you don’t have to settle for plain balloons, streamers and confetti. You can fill the party with custom Mario-themed balloons featuring many of the game’s famous characters and symbols, or turn your walls into a scene right out of the video game with large wall decals. Birthday Express has just what you need to transform your location into Nintendo’s classic game. Every great birthday party has a killer collection of balloons. The Super Mario balloon bouquets are available in two options Mario and Luigi foil balloons accompanied by green and red balloons, and Mario and a Super Star with yellow and red balloons. You have the balloons, banners and other decorations all set for an incredible Super Mario birthday party, but don’t forget about the tableware! Even the small details count when it comes to throwing a successful party. Birthday Express has all of the supplies you need for a flawless table placement. Set the foundation with a themed table cover and then top it with Mario-designed dinner plates, napkins cups and silverware. Don’t forget about the cake! 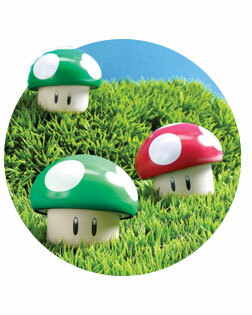 Add the Super Mario Cake Topper to your cake and then serve your guests on the Luigi dessert plates. One of the hardest parts of planning the perfect party is the entertainment. It’s not an easy task keeping kids busy and engaged. Birthday Express knows how wild and energetic kids can be, which is why they have a selection of Super Mario activities already prepared to help your birthday party go off without a hitch. You can keep it simple with sticker books and temporary tattoos or get the kids more involved by playing dress up with Birthday Express’ collection of Super Mario Bros. costumes. This party classic has been entertaining kids for ages, and it’s an easy way to get partygoers active. The Super Mario Party Piñata Kit includes the piñata, blindfold, buster stick and a filler bag of candy and toys that party guests will love. Mario, Luigi, Bowser, Goomba and other fan favorites appear on these Super Mario sticker sheets. They can be given away as rewards for games throughout the party, or you can hand them out as party favors when the party is over. You’ve chosen a Super Mario theme, so why not have guests play the video game that inspired the party’s theme? Let kids collect coins and avoid fireballs as they work their way through the levels to reach the castle where Princess Peach is waiting to be rescued. Bring Mario to life at your Super Mario birthday party with this costume kit. Your child and party guests will enjoy taking turns trying on Mario’s hat, gloves and mustache, and the costume is bound to produce some memorable moments. Just be sure to have your camera ready! 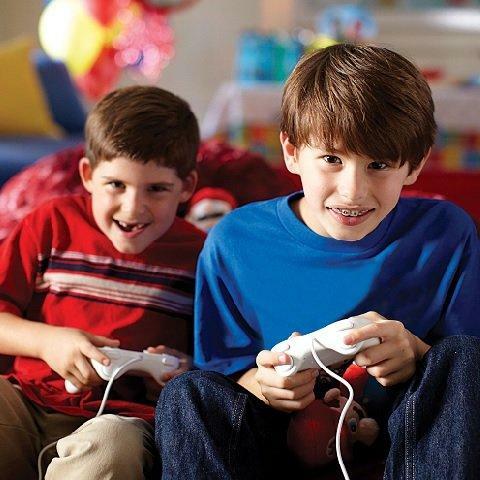 Your child’s Super Mario party will be one that kids will want to remember. With party favors, guests can take a piece of the party home with them and let the fun continue after the party ends. Party favors are also a simple way to thank guests for attending your child’s party and making it a day worth remembering. If you’re stumped for ideas on how to make the best party favors, let Birthday Express do the work. 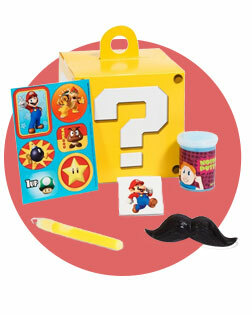 A variety of Super Mario-themed party boxes filled with sweet treats and toys are available for you to choose from. Send partygoers home with a mixture of fun toys to remind them of all the fun they had at your Super Mario birthday party. The favor box includes stickers, a Mario tattoo, Noise Putty, glow stick and a wax mustache so they can keep playing Mario at home. Satisfy everyone’s sweet tooth with these delicious Whirly Pops. 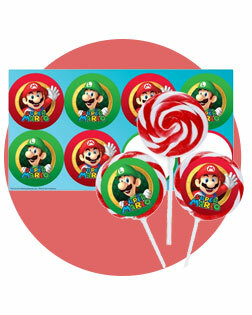 The kit also comes with Mario and Luigi stickers that you can place on the Whirly Pops for a yummy Mario-inspired treat. Hand out the Whirly Pops as a sweet snack at the party or let them save the sugary goodness for when they get home.